Tres My Heart (inside) gets up over Flight To La Jolla to set the fastest qualifying time for the $100,000 QHRAI Derby at Indiana Grand Saturday. SHELBYVILLE, IN�OCTOBER 4, 2018�Tres My Heart and Giovani Vazquez-Gomez had a job to do Saturday in the trials for the Quarter Horse Racing Association of Indiana (QHRAI) Derby and they handled their assignment with ease to qualify in the top spot for the $100,000 final slated for Saturday, October 27. Starting as the favorite of the field from post six, Tres My Heart had very little trouble getting out of the gate quickly and took over the top spot in the 400-yard dash. The HEART OF THE CARTEL filly stayed focused on the wire the entire way, winning by a nose over Flight To La Jolla and Shanley Jackson, who closed late for second. Lota Cac and Berkley Packer rounded out the trifecta. 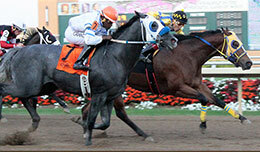 Owned by Jose Plascencia, Tres My Heart is now three for four in her brief career. Unraced at two, she was a winner earlier this summer in the $50,000 Indiana Grand QHRAI Derby. She is trained by Hector Sanchez and topped $50,000 with her win in the trial as she heads to the QHRAI Derby final during the final all-Quarter Horse racing night of 2018. The time of the dash was :19.923 seconds. Canadian River Quarter Horse LLC bred Tres My Heart in Oklahoma from the Tres Seis mare Famous Mariah. In the second division for the QHRAI Derby trials, a filly with a familiar relative made her Indiana debut as Jess Shantastic and Oscar Cordova posted a win in a time of :20.060 seconds. After getting a good break, Jess Shantastic was in contention the entire way before inching up for the win by a neck over BS Special and Juan Galvan. Eyesa Llano Senator finished third. Jess Shantastic is owned by breeder Stanley Forbes, who also bred and raised Rockys Candy Shop, multiple stakes winner this season at Indiana Grand. Now trained by Paul Sedillo, the Fantastic Corona Jr. filly just missed the win in the $145,000 La Fiesta Derby at Albuquerque by a nose in her previous start. Jess Shantastic is out of the same stallion and mare, Jesses Candy by Mr Jess Perry, as Rockys Candy Shop, owned by Lance Finlinson and trained by Randy Smith. For the top 10 qualifiers for the $100,000 QHRAI Derby, with their times, sires, dams, owners, breeders, trainers and jockeys CLICK HERE. Trainer Randy Smith will saddle three in the final (Lota Cac, Eyesa Llano Senator, Tellem Im Rockin) while Trainer Tony Cunningham will saddle two (Shonuff MVP, Candida Fits).